• Since 1928, no month sports a lower average return than September, with the S&P 500 down 1.0% on average. February and May are the only other months that are generally in the negative, while July surprisingly tends to be the strongest month of the year. • Since 1928, the S&P 500 has been higher in September only 43.8% of the time, which is by far the lowest amount—as no other month is less than 50%. December is up most often at 73.0%. • Since 1950, September has been the worst month of the year down 0.5%, while the past 20 years it has been the second weakest month, with August faring worse. • The worst September ever for the S&P 500 resulted in a 30% drop in 1931. In fact, no other month has had more 10% drops than September at seven. Interestingly, January is the only month that has never been down 10% or more. • Over the past 10 years, September has been positive on average, with the S&P 500 up 0.1%. But it is worth noting that September has been lower each of the past three years. • Since 1950, if the S&P 500 starts the month of September above its 200-day moving average (like 2017 will), it tends to do much better, as it is up 0.4% on average versus down 2.7% if it starts the month below the 200-day moving average. • Last, August is historically a weak month as well. 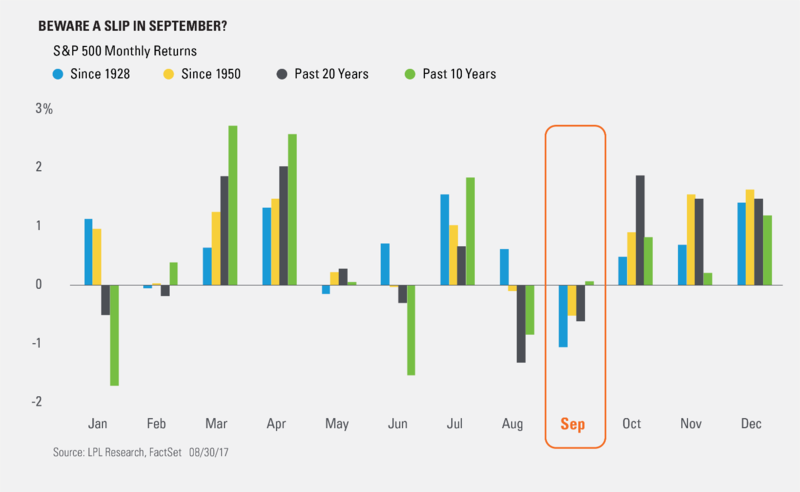 Generally, when the S&P 500 is lower in August what we tend to see in September is that the month is down as well. On average it’s been down 0.4%, right in line with the average monthly return.